Fixing light strikes by "Legionnaire"
Thought I'd post the solution I discovered for fixing light strikes on the shotgun barrel of my 24E-DL. The Problem: I have a very nice Savage 24 E-DL .22 mag/20 gauge combo that I bought used. The .22 mag shot fine: reliable and very accurate. The 20 gauge, however, only fired sporadically. I'm guessing that the gun fired 30% of the time using Remington #8 Game Loads. But the gun would NEVER fire if pointed up at anything more than a 30 degree angle. The primers showed signs of light strikes. I completely disassembled the gun, cleaned the firing pin channel. I also ordered and installed a new firing pin from Numrich. Things were better; ignition 60% of the time, but still unacceptable. So I ordered a new plunger, main spring, and a bunch of other internal parts from Numrich and played with the lot. Solution:With the "new" parts from Numrich, the problem was worse! So once I had the gun apart again, I studied all the parts I had to see how they were different. Turns out that the critical factor is the angle of the mainspring plunger head. If it is bent down a bit, it exerts more forward pressure on the hammer, and less on the "standoff" that keeps the hammer from contacting the firing spring when the action is at rest. 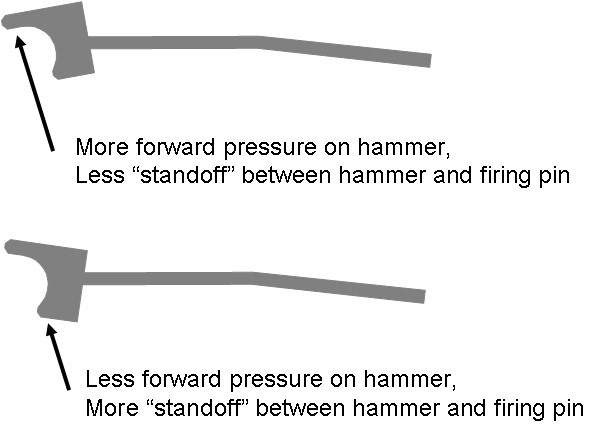 If the head of the plunger is canted upwards, the standoff distance is greater, and there is less forward pressure on the hammer. The pic below shows what I mean. Once I figured this out, it was a simple matter of bending the plunger head down, bending the plunger shaft slightly so it aligned properly in the frame (it's more of a gentle curve than the angle shown in the illustration), and putting everything back together. Back to the range and had 100% ignition, even with the cheap Remington loads (also tried two versions of Winchester). Hope this helps with others experiencing the same or similar problems.